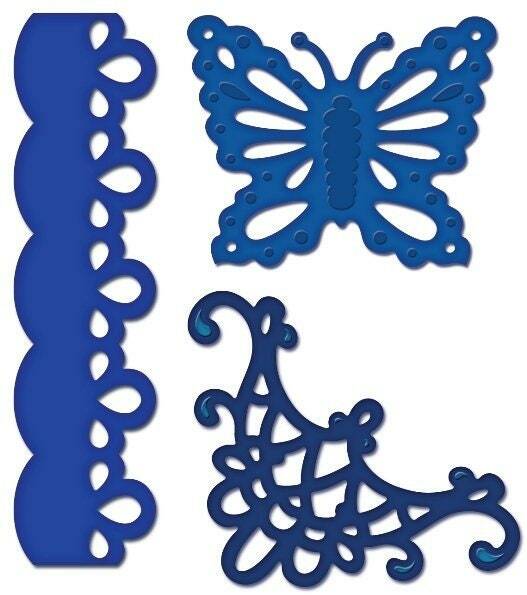 HCD 702 Decorative Butterfly-Bprder Die is a custom Heartfelt Creations Die manufactured by Spellbinders. This set of dies coordinates with our Posy Patch Collection. The Butterfly die in this set coordinates with the Butterfly stamp in HCPC 3306. There are 3 Dies in this set. Border Die: 4" x 1 1/8"
Butterfly Die: 1 3/4" x 2 1/4"
Corner Die: 2 1/8" x 2 1/8"